Best wishes today for the three-time series champion and the all time leader in IndyCar wins - 19 of them in 108 starts. Born July 2nd, 1979, in Defiance, Ohio, Sam Hornish Jr should be having a ball today. Unfortunately, it sounds like he's not in the best of moods. According the the Charlotte Observer, his bags are packed and he's nearly out the IndyCar door. A full-time move to NASCAR for reigning IndyCar Series champion Sam Hornish Jr. seems all but certain. Hornish, a three-time Indy Racing League champion and former Indianapolis 500 winner, is expected to join the Nextel Cup Series full-time next season with Penske Racing, the Observer has learned. Penske has a primary sponsor to field a team for Hornish, sources said. Not sure if that really advances anything we didn't already know because it doesn't really say much. However, Uncle Sam's words may speak a bit louder. "You feel like they don't need you sometimes," Hornish told PA SportsTicker. "They've got their stars. That's another reason why you might want to do something else." Excuse me while I start humming "Hey Jealousy". Meanwhile, the intrepid Curt Cavin follow up on this (because that's what actual reporters do). According to Cavin, no decision has been made. "Hand over my heart, we don't have any plans for Sam for next year," Penske Racing president Tim Cindric said. "Just like his real boss (his wife) just told you, even he doesn't know yet what he wants to do. "He's driving our Indy car until we tell you different." Again, no news is somehow news. Weird. At any rate, Happy Birthday Sam. 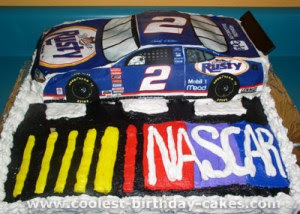 Someone let us know if he's actually celebrating with a NASCAR decorated cake. WTF does that mean? Last time I checked he was one of the biggest stars in the league, and what, napcar does need you? Um, speaking of cake. I think Sam may already be on Tony Stewart's NASCAR Diet™ if you know what I mean. Sam had better ask AJ Allmendinger how that open wheel to taxicab career move is working out before he peevishly stomps over to NA$CAR. I'm rapidly losing interest in Sam, who used to be my favorite driver. Love the Super Deuce cake. Nice touch. Indy Sam Fan I am! Indy Sam fan I am. I would not like NASCAR Sam and Dan. I would not like them, Indy Sam fan I am. with a friend on Fox? Not in a tin box. Not with a friend on Fox. I would like them here, not there. I would not watch NASCAR anywhere. I would not like them, Indy Sam fan I am! with a friend on Fox?" Now THAT'S a comment! Excuse my whilst I wipe the spit beverage off my screen. Hornish is correct in that the IRL's marketing is dumb. Basically most of their efforts are centered on someone who has never finished higher than 3rd. I will be po'd if Sam leaves. At him and at the IRL for helping him make his decision. NASCAR can lose Jeff Gordon and the IRL can not afford to lose Sam. Name one American besides Marco that is marketable for racing reasons that would be left?